The reviews never stop do they? 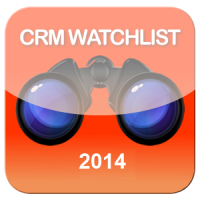 This week we take a look at the CRM Watchlist 2014 Marketing companies. Again, they are not “category winners” and they are in alphabetical order. Check out Hubspot, Marketo, and Teradata Applications. Your thoughts? Monday, you had CRMnext, Infor and NetSuite as CRM suite providers. Today SAP and SugarCRM are here for your scrutiny. Can life get any better? We move on to the CRM Watchlist 2014 Elite specialists – Blackbaud, Infusionsoft, Xactly. They each dominate their market, they each have a culture to be proud of and…other things. Read on to see what they are doing and what they should be. Today begins the CRM Watchlist 2014 reviews. The Elites get first dibs on the discussion – up first the vendor generalists – Salesforce.com and Microsoft. “As long as they keep making it easier and faster to get my stuff, that’s all the customer service I need.” Paul Greenberg and Brent Leary explain why Amazon.com wins CRM Watchlist’s Lifetime Achievement Award.